The last few days have been very stormy, which means, we have been staying indoors. Last night was suppose to be the stormiest evening of all. The way the weather people were talking, we were going to be getting widespread tornadoes. Because of this, I had planned an evening hunkered down with the family. As the day wore on, it looked as if we were looking at late night storms. My dh called to see if we all wanted to go out to eat at the favorite Mexican Restaurant. One of my sons was wanting to spend the night at a friends house, and the other son was not wanting to go anywhere (he's pretty much a homebody), so it was just the two of us. By the time dh got home it was 7:00. The storms still didn't seem anywhere near, so we headed out. When we got there we found we were not the only ones that had the idea of going out to eat. We always like going out to eat, and we've taken our kids with us a lot, even when we had four very little ones. We took them out to eat to teach them how to act, and they have always been very good. From the beginning, though, we taught them that you do not get up and run around, and that you use a quiet voice, etc. I have found, though, that a lot of people do not teach their kids manners when going out to eat. As a college student, I was a waitress, and it really got on my nerves when people let their kids run amuk. Numerous times, I can remember a kid barreling into me when I had a full tray of food or drinks--not fun. Last night was a night mare. As I mentioned before, the resturaunt was very busy. Many of the patrons were families, and most of these families let their kids run wild. I could not believe it! These kids were probably around 9, 10 or 11--old enough to know better. The resturaunt had a free ice cream machine at the front, so after you pay your bill you can get an ice cream cone for the road. These kids were running from the back of the resturant to the front and back again getting numerous ice cream cones. There were about 10 boys in all. They would run, get their cones, run back, finish their cones, and then run back for another one, making an extremely big mess of the machine. This went on the entire time we were there. Don't get me wrong, I love kids--I got four of my own--but I really hate it when other peoples kids are making such a nusinance. Not one time did I see an adult say anything to these boys. Yesterday seemed to be one of the longest days. Tuesday, I took my middle son, Scott to soccer practice. We got there a little early, so he and two other boys were kicking the ball around and warming up. Scott kicked the ball, and his knee popped. It hurt, so he sat down, rubbed it and thought, "oh maybe I need to stretch a little more." After stretching a little more, he got up, and proceeded to kick and juggle the ball around like all soccer players do. Soon, he hears pop, pop! This time his knee gave out and there was no getting up. By this time, most of the boys and coaches were there. A couple of the coaches came up to Scott and looked at his knee. I'm sitting in the car wondering if I should just sit tight, or embarrass him by getting up to see what happened. Soon, he is hobbling to the car motioning me to stay, which I did. Wednesday, first thing, I called the doctor to see if I could get him in. Yes, but not til 1. Well, Scott and his younger brother Benjamin both had eye doctor appointments at 2. It is so hard to get those appointments. I begged them to see if I could come in earlier. No way. So I called the eye doctor, and we were in luck. I was told to bring them in now. We zoomed over to the eye doctor, and got done there just in time to be 5 minutes late to the bone doctor. Then we sat, and sat, and sat. We were all STARVING!! We had not eaten since 7 a.m. and it was 2:15. So I got up and politely asked about how much longer. I was told the doctor had been in surgery and that it probably will be a while. I sure wished they would have told me this when we first got there. We could have ran across the street and gotten fast food and come right back. With my hypoglycemia, I really need to eat, and I was not doing to well by this time. I get very irritable and my mind gets real fuzzy, and I get shaky with a cold sweat if I don't eat. Soon, we get into the see the doctor. After x-rays, the doctor comes in and sees that all seems to be ok. He starts poking and prodding, and nothing hurts much. THEN--he hit the right place and boy did Scott jump. "Hmmmm," the doctor says. He told us that Scott needed an MRI, because the xray dosen't show us all the ligaments and such. I asked him what he thought it might be, and he said he was not sure, but it could possibly be the meniscus (wow! we felt so smart....LOL). This weekend we picked up our new water fountain. I really love this fountain. I have been doing a lot of shopping and looking around. Most everyone here has the same type fountains, and I wanted something different. The common fountains I see in our neighborhood have fleur de lis on the top--of course, we live in Louisiana! Those that don't have the fleur de lis, have a pineapple on top, which I really like. I also like the pots, but most are more of a Southwest theme, and even though I really like the Southwest look, that would not look right with our style of house. 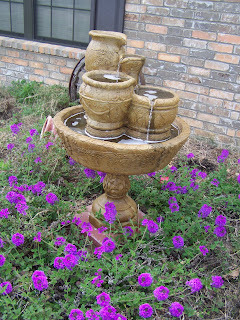 When I came across this fountain with it's old world pots pouring into each other, I knew this was the one for our yard! Other things we did in regards to our yard this weekend, was to go shopping. We really did not buy anything, but did price comparison. After the shopping, we came home and took out eight of our bazillion azeala bushes and put them in the back along our fence. They really look good. We also potted some Mexican Petunias that one of my walking buddies gave me. Little by little our yard is coming together. 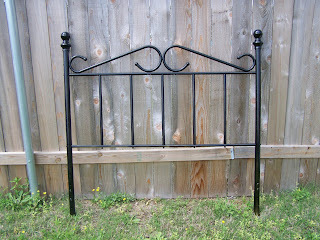 Throughout the week, I sanded and prepared an old headboard we had in the garage. 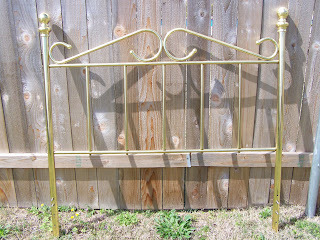 It was on my daughter's bed, but she did not like the fake brass and so we took it off. I thought it would look good black and maybe put it in our back yard garden. After painting it, I really like the look, and I think it may be going back on her bed. She's away at college right now, but I think when she gets back it will be a nice surprise. It still needs one more coat of paint. When our family moved to Florida, I was just turning eight and entering the third grade--this was August of 1967. Yes, I know I just dated myself, but I really don't mind broadcasting my age (hey! I've made it this far so I should be happy!!) At the time, the public school system down there was having some problems, so, even though we were not Catholic, my parents decided to enroll me in the local Catholic school--St. Mary's...complete with Irish nuns. From third through the eighth grade I was taught by Irish nuns. Some of them were quite stern, but most of them had a funny side to them. I can remember going to the Fall Festival and seeing one of the nuns driving around the tractor for the hayride. During recess or P.E. some of them would get involved playing some of our games. I also learned later on that the ones I thought were so stern, had a soft side to them too. I grew up with a mixture of accents--Irish, southern, and because a lot of people came from the Northeastern part of the U.S. we had the New York accent as well. It was really funny to listen to many of my friends, as they would have an accent with a mixture of all of the above. You never could tell where people were from. As far as my sisters and I, we had a mixture of Southern and Western. Even though we spent all of our lives in the South, our parents were from Colorado, and that is where the Western accent came in. I'll have to say, I have mixed feelings about going to a Catholic school when we were not Catholic, but for the most part it was o.k. and I do have fond memories of hearing the Irish accent on a daily basis. It made life interesting, and maybe that is why I have a special place in my heart for St. Patrick's Day. For the last several weeks, we have gone up and down when it comes to the temperature. One day it climbs into the 70's the next day it may only be 50 if we're lucky. No wonder everyone has been sick. The last few days, though, have really been nice. I'm not sure if it is a tease, or if spring is here to stay (I hope it's here to stick around for awhile). Yesterday, was one of those days when you really feel like getting out and doing something in the yard. We did not really have a chance to do so, but we did do some preparations. 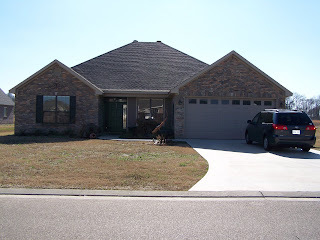 In August 2007, we bought a new home. Many times with a new home comes very little landscaping, if any. That was our case. We have gone all around with what we actually want to do. We checked into having someone come and do the work, but after a good laugh about the cost, we've decided, we would do it. It may take longer, but in the long run, we not only save big bucks, but have the satisfaction of saying, "We did that!" Since we live in Louisiana, and in a subdivision that is very French inspired, we've decided to go in that direction but with a little twist. Being from Florida, I love the tropical look, so I guess you can say we are going "French Caribbean" or French Polynesian." I really can't find such a thing on the internet, so I am having to come up with what I think exactly that may be. In our backyard, we are going to have maybe a few fruit trees, definitely a vegetable garden and the rest will be tropical, including something I've always wanted--a tiki! BUT!! except for the vegetable garden the backyard is going to have to wait for the front. After looking at many pictures and episodes of garden shows, I think I know what I want, except for a weird spot in the front which I will address later. Last year we did do a little bit of landscaping. We did a nice area around our mailbox--with Red Buds, small grasses and some yellow Lantana. It was really pretty when in bloom. We also planted a couple of Sago Palms around the front door, but only one survived. Lowes was really nice about taking it back. After much consideration as to what to do there, we've decided to put a waterfountain in it's place. I am so excited about it, as I've always wanted one. I get to pick it up tomorrow and hopefully by the end of the week, it will be up and running (that is if it doesn't rain everyday like the weather man is promising). As for the weird area. We have a small porch type area that runs under a big front picture window. Infront of this cement area is a small grassy area. I have thought about putting a tree there, as most people do, but then when you are sitting on the porch all you see is a big tree in your face. Then I thought of putting the fountain there, but then again, it would be awkward to sit there, as the sitting area is pretty narrow. We have thought of putting some sort of stone area and small plants, now we are entertaining the thought of maybe putting pavers or decorative cement there and then having a bigger sitting area. I would have a lot of potted plants around, etc. We'll just have to see. First, though we are going to finish the front, and the side you see as you drive up. Hopefully that will be finished before my daughter comes back from college for the summer. Help! I Need Girls Camp Craft Ideas!! Last year, I was in charge of girls camp crafts at our church. I guess I did such a good job, that I have been asked to do it again, and I need some ideas. Last year, we made earrings from pop tops off of canned drinks, duct tape bracelets, flip flop note pad, and a pin made of safety pins and beads. This year, I think we are going to do a necklace, beaded bookmarks, maybe a crochet beaded bracelet. As you can see most of my stuff is beaded and/or jewelry. You see, I am a beader, and have been making jewelry for about 14 years now. I think I need to branch out a little for camp. I love to craft, but most of the stuff I come up with is either too pricey or too difficult. One thing I learned last year, that most people are not crafters. So, I need something cheap, easy, fun and maybe a little practical. Last year we had about 40 girls, this year we are expecting probably 50 or so. This year camp will be the first week in June.